It’s been eight years since the death of District Attorney Harvey Dent, both Batman and Bruce Wayne have been out of the public eye, and Gotham City has been changing, mostly for the better, as Commissioner Gordon (Gary Oldman) has cracked down on crime. Even so, with the impending threat of an international terrorist and mercenary named Bane (Tom Hardy), Bruce Wayne (Christian Bale) has to decide whether it’s time for the Batman to return, complicated by the entrance of a skilled cat burglar named Selina Kyle (Anne Hathaway), a rookie cop named John Blake (Joseph Gordon-Levitt) and enterprising businesswoman Miranda Tate (Marion Cotillard). Easily one of the most anticipated movies of the summer, the thought of seeing Christopher Nolan’s final step in remodeling Batman for modern day audiences could very well be an overwhelming experience if one doesn’t go into it with slightly tempered expectations. Being another movie where the biggest twists could be carelessly spoiled by inconsiderate critics, we’ll do our best to not be one of them. Taking place quite a bit after “The Dark Knight,” one can almost feel the pressures of Nolan trying to recreate the magic of that movie using a similar formula to introduce the villain in the first six minutes before it gets into the struggle of Christian Bale’s Bruce Wayne to get back on his feet after being away for seven years. That’s just fine as long as you don’t mind a Batman movie where we don’t see Batman for a good 40 minutes, but Bale and Nolan have done such a good job establishing their version of Bruce Wayne as a definitive one, it’s perfectly acceptable they chose to take a slower approach in setting up a story that throws a lot Bruce’s way. Rather than drawing from the comics, Nolan instills real world issues into his Gotham City with a conflict that forays into corporal punishment, the stock exchange and ideas for sustainable energy–all things we might regularly read about in the papers, which either will make the situations more relatable or will have you rolling your eyes at having politics mixed in with your entertainment. Making a story that revolves around the distinction between Gotham’s haves and have notssomething that’s permeating many works of fiction right now–may seem fairly hypocritical for a filmmaker who is probably living as comfortably as Bruce Wayne by now. Trying to pile so many ideas into the first hour leads to an incredibly convoluted plot set-up that’s all over the place as it introduces new characters like Joseph Gordon-Levitt’s police officer, whose first meeting with Wayne seems as forced as his later romance with Marion Cotillard’s Miranda Tate, something that comes from out of left field and may not have been necessary. It takes a long time for the existence and purposes of these characters to become clear, making the first half of the movie that much more frustrating. To be honest, Bane has never been the greatest Batman villain. To some older readers, he represents a time in comic books that was fairly devoid creatively and was more about selling as many comic books as possible through “event storytelling.” Tom Hardy’s Bane is a far more developed concept, a violent beast of a man with brains to match his physicality, certainly worthy of the Batman movie universe and a more formidable physical foe compared to the Joker or Scarecrow. It’s fairly obvious Christopher Nolan threw out the idea of using the comics as any sort of reference long ago–the direct correlations to them can be counted on one hand–but he’s created a decent origin for Bane that ties into some of the ideas introduced in previous movies while not completely ignoring the comics. The character’s voice is pretty distracting though–he’s understandable enough, but the accent and proper English inflection just doesn’t seem like what one would expect from a child born and raised in an underground prison. As one might expect, the film looks fantastic with Nolan’s trusted team delivering another fantastic film. That said, it’s disappointing that Gotham City has moved even further away from being the stylized city from the comics, now looking exactly like Manhattan with Nolan’s team doing very little to mask obvious landmarks and street signs. While it allows for some great panoramic establishing shots that take full advantage of the larger IMAX screens, some of the decision on when to switch to IMAX footage isn’t particularly consistent and some of the earlier non-vehicle-related fight scenes certainly don’t benefit from the larger format. Fortunately, many of these issues are at least partially forgotten once Bane finally emerges in the Gotham daylight and we see the scope of his master plan to terrorize Gotham City. We won’t say much about it–imagine the Joker’s coup de grace on a much larger level–but it’s not exactly the most original one and some may be disappointed by how closely this terrorist plot mirrors “Batman Begins” especially by cutting off Gotham’s bridge system. Then again, this is also when things starts to get cooking in the way we’ve come to expect from Nolan with the larger scale action scenes involving the tricked-out Batpod and a new flying vehicle called simply The Bat being quite fantastic. Fortunately, Nolan also figures out a convincing way to wrap everything up in a nice bow, making one feel like he’s created a bonafide Batman story in three movies that can stand up on its own merits completely separate from the comics or any previous incarnations. 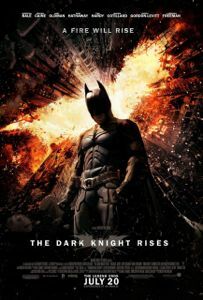 The story isn’t quite as solid as “The Dark Knight” and the main villains aren’t quite as memorable, but having a director with such a strong vision and conviction to fulfill it makes Nolan’s Batman finale pay off at least as a bookend to “Batman Begins” even if it may require quite a bit more patience than both previous films.